Warning: (Mac Users) The Safari Browser Cannot Be Used To properly support an HTML email signature, the Safari web browser cannot be used for your signature installation. 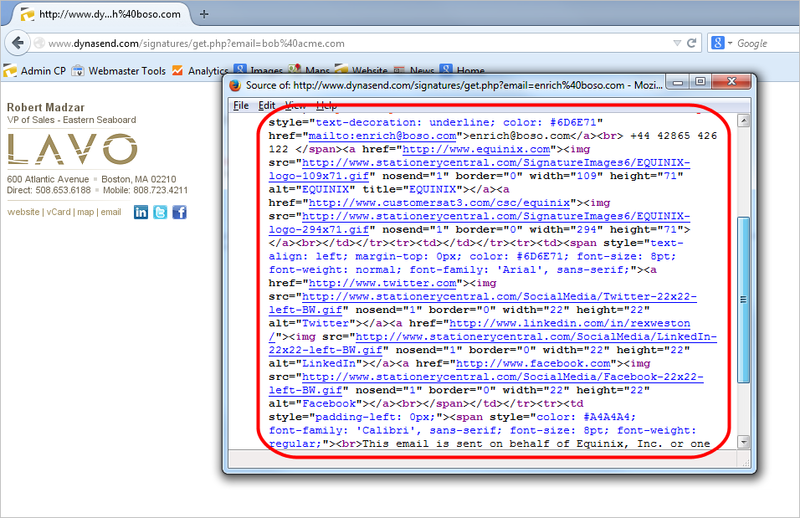 The formatting will turn out wrong if Safari is used to open and copy the signature. 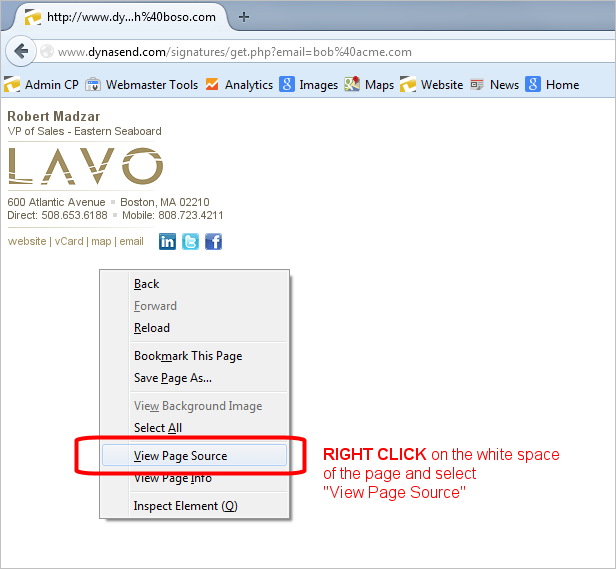 Now go to the tab that is displaying your signature and RIGHT click on the window’s white space beneath the signature and select “View Page Source” (see below). You should then see the actual computer code that makes up your signature (see below). First, press either Command-A (Mac) or Ctrl-A (PC) to select all of the computer code. It should all be highlighted in blue (see below). 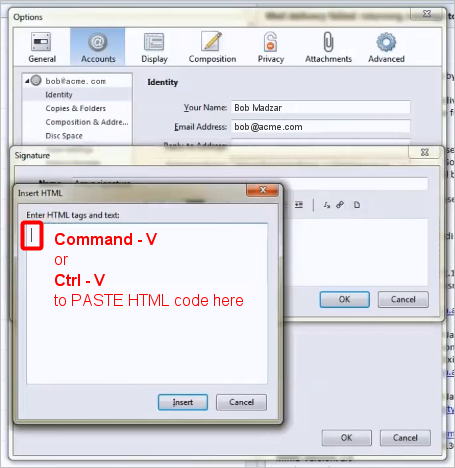 Second, press either Command-C (Mac) or Ctrl-C (PC) to copy the code to your computer’s clipboard. You will not see anything happen as you do this. 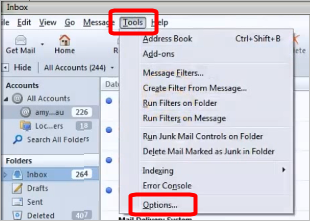 Go to your Postbox Inbox and click TOOLS in the top menu and pull-down to OPTIONS (see below). Click IDENTITY and then click the top EDIT button (see below). 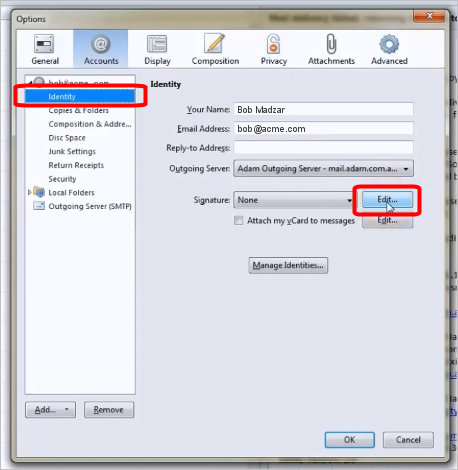 Note: If you have multiple email accounts set up, make sure that you are working with the email account that you want to apply the signature to. Now type a name for your signature. Then click the little “ paper” icon located at the right end of the formatting toolbar - if you hover over this icon you’ll see “HTML” (see below). 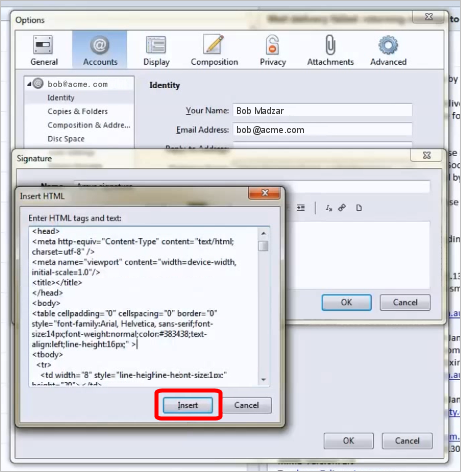 You should see a pop-up dialog box that is labeled “Insert HTML” - place your cursor inside this box and press either Command-V (Mac) or Ctrl-V (PC) to PASTE your email signature’s HTML computer code (see below). 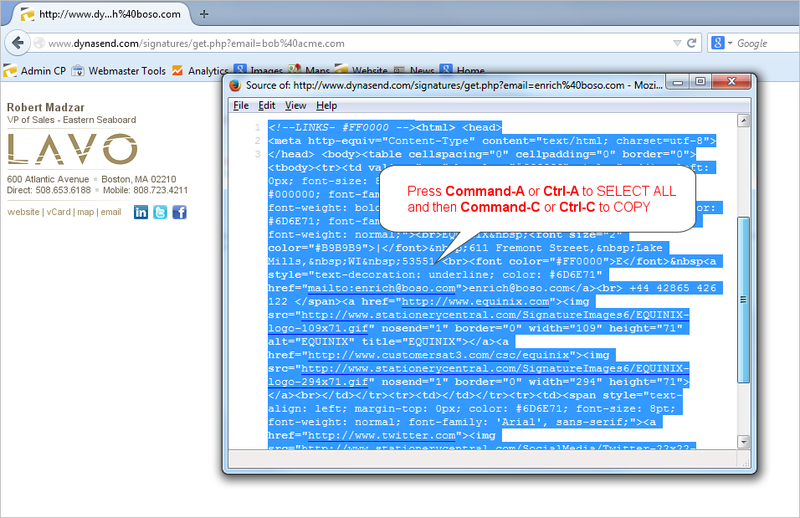 With the code pasted into this dialog box, click INSERT (see below). 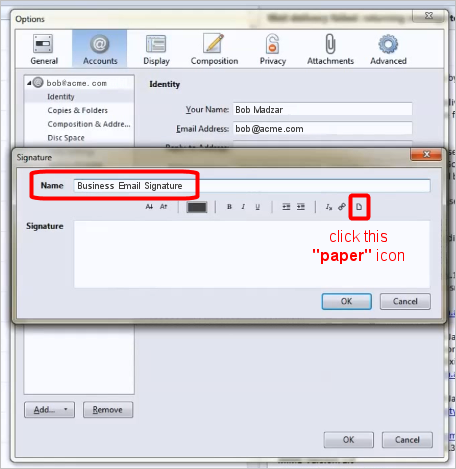 You should now see your signature (possibly enclosed by some ugly gridlines) in the signature dialog window. Click OK (see below). 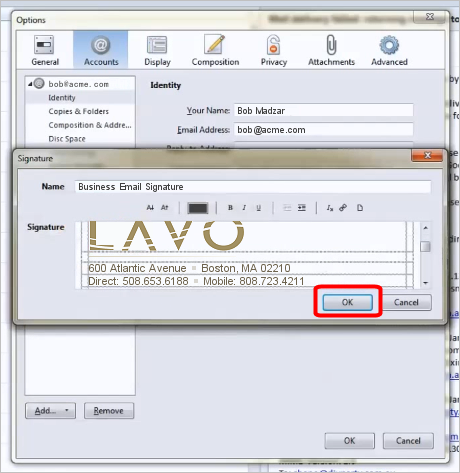 When you go to compose a message you should new see your signature. Please note, the gridlines will be visible while you compose your messages. 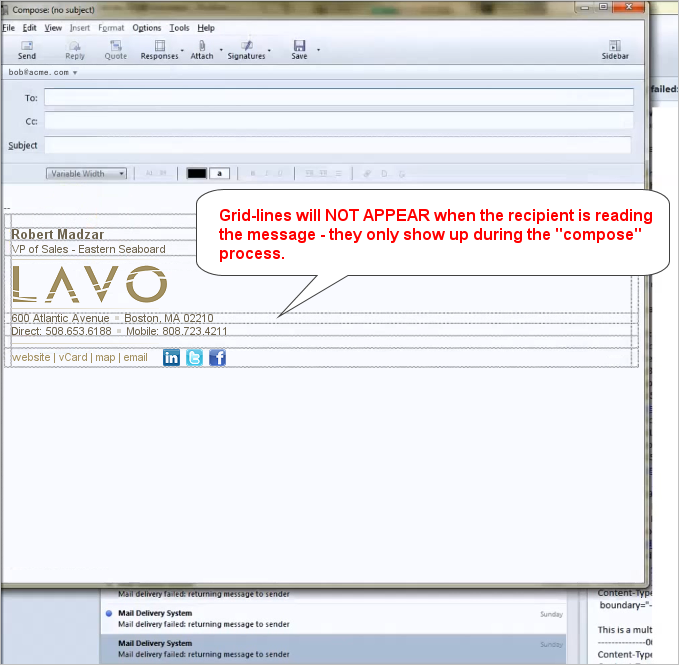 The gridlines will not appear to the recipient when they have received and are reading your message. They may appear temporarily when the recipient clicks reply and is writing back to you. All email has two modes - “compose mode” and “read mode” and they behave quite differently from one another at times (see below). One final note: Any clickable hyperlinks in your email signature will not work while in “compose mode” but should work properly when your message has been received and is being read.